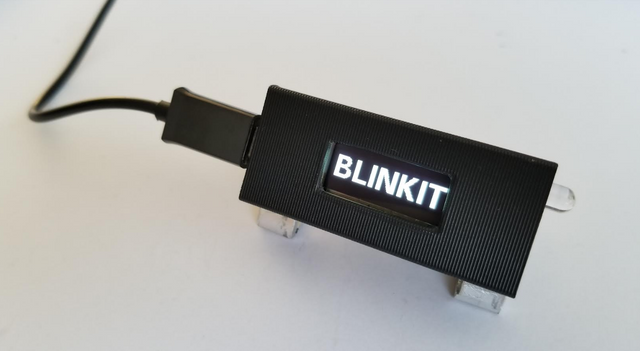 A wish for the Blinkit project for some time is, a inexpensive stand alone device that can connect to Steem by itself and can notify the user about Steem account activities such as New Upvotes, a first step for this kind of dedicated device are made and resulted in a first "proof of concept" V1.0 which is described in more detail below. "The start of a small inexpensive Steem connected IOT device that notifies it's users with sound and light, about Steem actions such as New Upvotes!" The used Arduino model where this first development version can run on cost around 10,- usd, and are easy to buy online, and the instruction needed to get it up and running are, and will be made as easy as possible. (beside that the boards can be bought from 3rd parties, there will also be looked into offering them pre installed as a starters kit with the board, enclosure and related components, offert to the Steem user, in exchange for Steem. This release is compatible with the following board : "Heltec WiFi Kit 8"
Connects over WiFi to the internet. Blink when New Upvotes are detected, Blinks the build in screen, and a optionally connected LED, as well a sound is triggered from the also optional to connect speaker (piezo). "World's smallest Steem connected device!" The device only needs a USB cable and USB (phone) Adaptor. (Or any free USB port to get power from will work) When the power is connected the following screens will be presented. When the main screen is loaded the blink action with sound and light will be tested by triggering it once. the dots are animated, to let the user know the device is online and working and ready to Blink on newly received Upvotes. 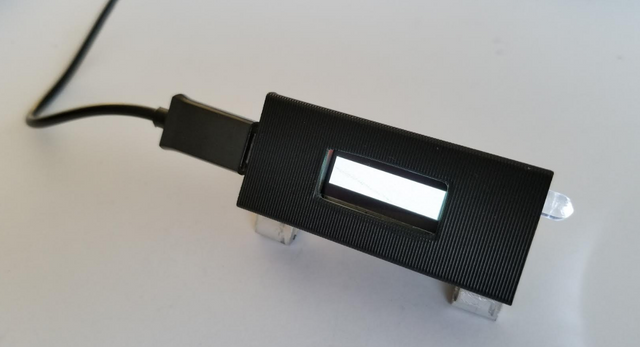 The Device is now ready to notify when New Upvotes are received, and when received the device will Blink the Screen, Blink the LED and play a notification sound. The used Arduino board for this first prototype is the Heltec "Wifi kit 8" it's easy to obtain from online sources, below is part of the code for this first stand alone version. To make the screen and WiFi work, the related libraries needed to be imported. 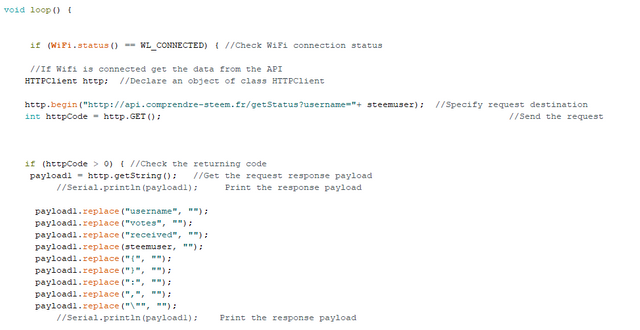 The users parameters can be changed in this part of the code, this will in the future be made more user friendly. When WiFi is connected download, upvote data into Global variable payload1 and strip out the unwanted characters to keep only the number of recieved upvotes. The upvote data comes from @oroger his API server, big thanks for maintaining the server. Part of the code that compares the downloaded data, this will in the first time it enters the loop result in the test blink action because the payload is still empty. When called, Downloads new data into global variable payload2 and calls the compare function again to compare the by the user recieved upvotes stored in payload1 and payload2. The notification sound, that is played over the speaker (piezo) can be set here in frequency, duration and number of beep. Example of how text is written to the 0.96 inch OLED display. 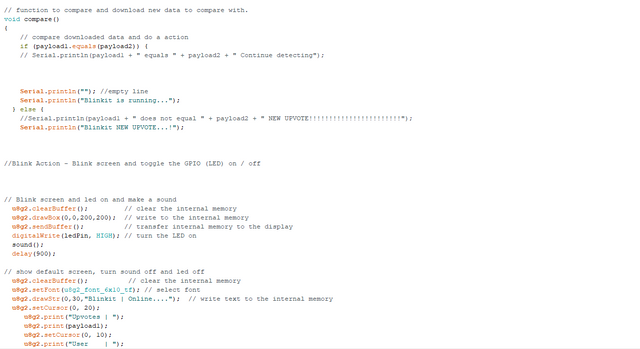 In the Arduino IDE software, the serial monitor output is set to be similarly presented as the batch feedback in the Windows version of Blinkit. The code for the project is commited to the Blinkit Github repository. readme file is added in the same folder. Do you already want to try this development version? 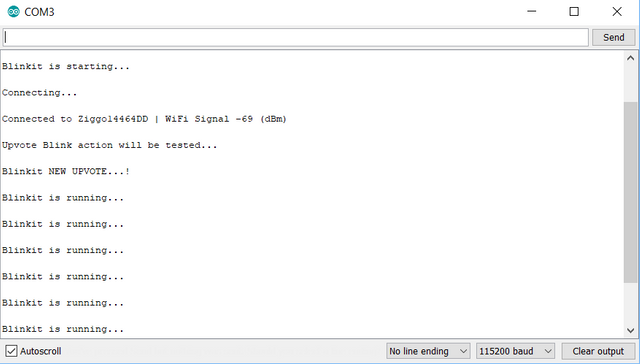 Get in contact on Discord and or Download it from the Blinkit Github repository: https://github.com/techtek/Blinkit and upload it to your "Heltec WiFi Kit 8", make sure you have download the required libraries, this can be done within the Arduino IDE, search for and download and install the ESP8266 and U8g2 libraries. 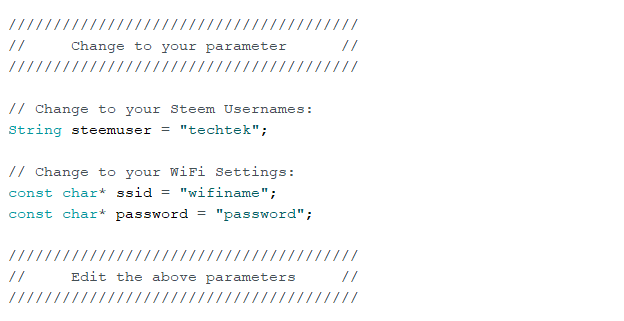 and after that load the Blinkit arduino sketch that you can find in the Blinkit, Arduino folder under Standalone, and change the WiFi parameters to that of your WiFi network, change the Steem username to your username and upload the code to the "Heltec WiFi Kit 8" board. If you dont have this IOT board, it can be bought online and is inexpansive, "Search for "Heltec WiFi Kit 8"
Please join the Blinkit Discord server and visit the Blinkit website. This project can also be found and funded on Fundition. and help to buy boards and parts for the team to test, do development work and helps to step by step bring the best possible stand alone Blinkit device and Blinkit software to you and all users. Improve the overall ease of use. Add a web interface, with device status and settings. What Are your thoughts about this new development, of a Steem connected notification device? Thank you for your contribution. I can see there are lot of Hardcoded values, is there a way you can put those in a separate config file, https://github.com/techtek/Blinkit/commit/5ef72c7e20f2023d039200128022571f2397f2fc#diff-37539844869fb7ea8d87defab640573eR29. Thanks for moderating, planned improvement are to also store values in the eeprom memory whose values are kept when the board is turned off, and is a place where it could also be stored and edited, even after it is uploaded and running on the board, but this is works in a different way compared to how values are stored now, and need to be looked further into. In Blinkit for Windows the values are stored in config files, and they get saved with values entered by the user from the Blinkit interface. For Blinkit stand alone, the approach to develop is, to let the user change the setting of the device with a web interface that stores them in the eeprom memory. Hi Thanks for your interest n the Blinkit device, at the moment there is only one option, where you would need to get it from a webshop, such as Banggood or Aliexpress. In the future, the goal is to have them pre installed and buy-able with Steem . Display the users total recieved upvotes on the second line Upvotes | recievedupvotes. It should be received instead of recieved. You did a great job with this product, nice to see a complete project build like this. 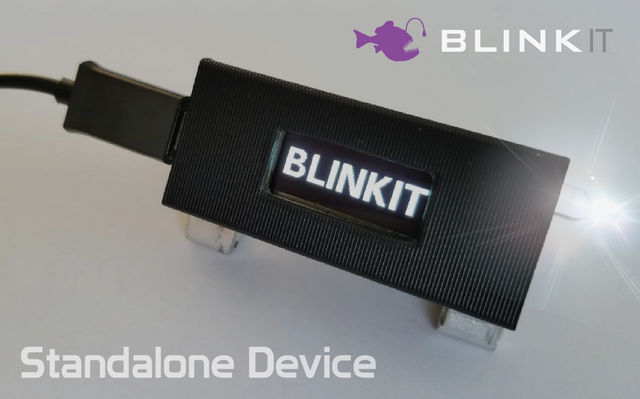 Hi thank you for your interest for the Blinkit stand alone device, Would Aliexpress or Banggood deliver to Nigeria?